The Midwest CWA Health & Safety team made things a little safer for our AT&T members who drive small trucks. The trucks, primarily driven by our members who install Uverse and DirecTV such as Premises Technicians, are quite small and fuel efficient. Though AT&T had carefully designed a vehicle load (known as a DVL) intended to ensure that the truck carried everything needed but was not overloaded, their tests had been conducted utilizing only one human in the truck – the driver. During real-world deployment of the trucks in the field, however, CWA noticed that in many cases these trucks would roll with two humans — usually the passenger was a trainee or trainer, but sometimes would be a manager conducting field training or evaluations. As a result, the Gross Vehicle Weight Rating (GVWR) would likely be exceeded because of the passenger’s weight. These vehicle weight limits are extremely important as they ensure that the vehicle is able to stop safely in the shortest distance possible. In the Midwest, as in other parts of the country, this is particularly important in the winter because an overweight vehicle on slick, icy road surfaces definitely presents a hazard. Do you have a safety concern in your workplace? If so, please contact the Union office to fill out a Safety Concern Form. The Safety Committe will review your safety concern and take action with management to correct any issues. 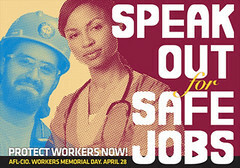 The theme this year when CWA activists and other unions observe Workers' Memorial Day on April 28 will be "Speak Out for Safe Jobs. Protect Workers Now" as workers step up the fight for safe workplaces and remember fellow workers killed, injured and made sick on the job. CWA President Larry Cohen is urging locals to mark April 28 by organizing actions to highlight the toll of work-related injuries, illnesses and fatalities. Workers' Memorial Day materials are available from the AFL-CIO at www.aflcio.org/WorkersMemorialDay. Craig Mathis, 55, of CWA Local 3519, Gulfport, Mississippi, AT&T facility technician who died on January 14, 2015, after suffering a heart attack, losing control of his company truck, and slamming into a utility pole. In addition, many of our members suffered work-related injuries, illnesses and "near misses." Too many job hazards, including overwork, long hours of work, and requirements for emergency alert equipment remain unregulated and uncontrolled, resulting in the continued occurrence of injuries, illnesses and fatalities. We must work to ensure employers are providing our members with safe and healthful working conditions. As part of our Workers' Memorial Day preparations, we are working to defeat "fast track." This fight is particularly important for CWA safety and health activists. Because of the TPP Investor State Dispute Settlement (ISDS) provisions, passage of "fast track" and the Trans-Pacific Partnership could undermine any improvements in the Occupational Safety and Health Act. ISDS would allow multinational corporations to challenge OSHA regulations that affect a corporation's expected future profits. As part of Workers' Memorial Day events, activists will contact their Senators and Representatives, urging them to Vote No on "fast track." Text TPP to 69866 to receive action alerts. Please contact David LeGrande, Director of CWA's Occupational Safety and Health Department for more information. In 2011, 13 CWA Ohio members/AT&T technicians were disciplined by AT&T for sustaining and seeking medical treatment for work-related injuries. The company charged that the workers had violated AT&T’s new accident /injury discipline policy, which claimed all work-related accidents and injuries are preventable and, thus, the fault of the workers. When technicians reported their accidents/injuries to their supervisor and later sought medical treatment (making this an OSHA-recordable injury), the company disciplined the workers for incurring a preventable accident/injury. Employees were placed on suspension from one to five days and they were placed on a five-year probationary period. If another preventable accident/injury occurred within the following five years, the workers were to be terminated. The Safety Committee would like to remind you to check your batteries in your smoke detectors and carbon monoxide detectors!